You may be asked to back your vehicle into an alley dock, bringing the rear of your vehicle as close as possible to the rear of the alley dock without going beyond the exercise boundary marked by a line or row of cones while taking your CDL Skills Test . It is important that you finish each exercise exactly as the tester has instructed you. If you don’t maneuver the vehicle into its final position you will be penalized. Start position. 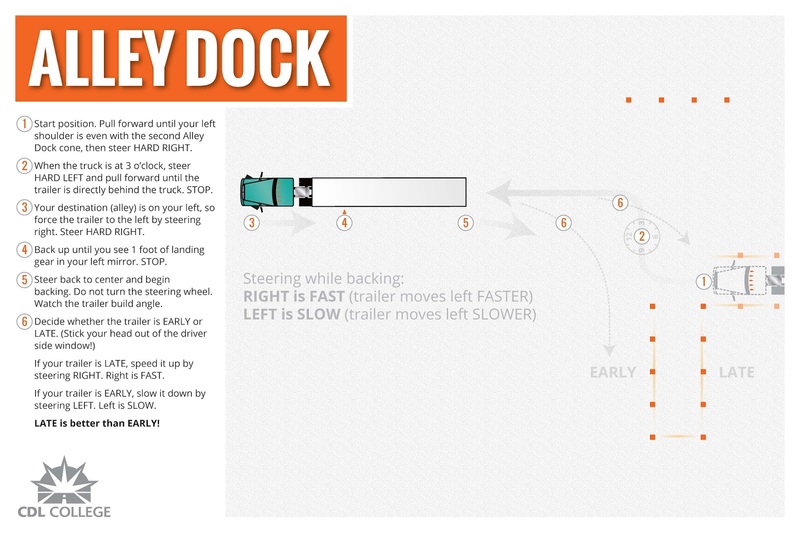 Pull forward until your left shoulder is even with the second Alley Dock cone, then steer HARD RIGHT. 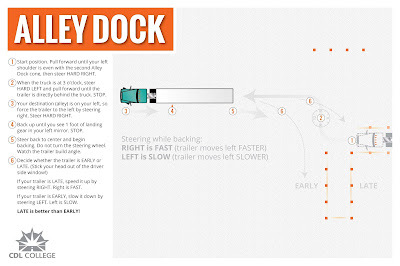 When the truck is at 3 o’clock, steer HARD LEFT and pull forward until the trailer is directly behind the truck. STOP. Your destination (alley) is on your left, so force the trailer to the left by steering right. Steer HARD RIGHT. Back up until you see 1 foot of landing gear in your left mirror. STOP. Steer back to center and begin backing. Do not turn the steering wheel. Watch the trailer build angle. If your trailer is LATE, speed it up by steering RIGHT. Right is FAST. If your trailer is EARLY, slow it down by steering LEFT. Left is SLOW. LATE is better than EARLY! You are allowed 2 free get-out-and-look(s), and 2 free pull-ups for this maneuver. Download the Alley Dock pdf version here.